Years ago, when I first moved to Kingston and was involved in a charity event, I called someone named Brit Smith to ask him for a donation for our cause. He said yes. Brit Smith has been saying yes to the Kingston community for 50 years. 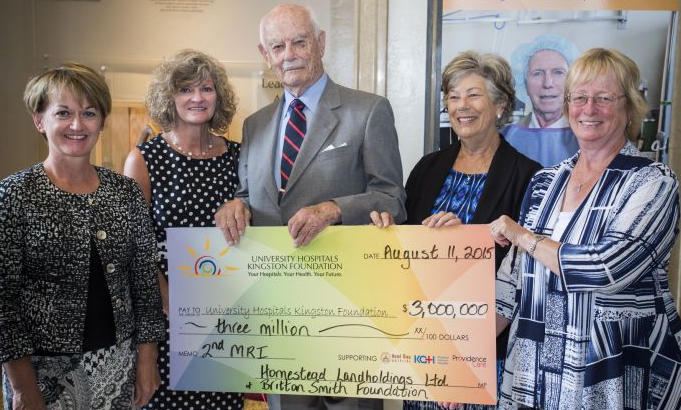 Recently, he pledged to donate the remaining $3 million dollars needed to Kingston General Hospital to purchase and install a new MRI machine. He was moved to make such a generous donation after hearing that up to 1,000 people may be waiting for scans. Thanks to his donation, KGH will get the machine a year earlier than planned. I found this wonderful Kingston Whig-Standard article about him published last year when he was awarded the rank of Knight of the French National Order of the Legion of Honour for his role and service in the second World War. He’s 95 now and still is active in his family-run business, Homestead Land Holdings going into the office every day. I’ve never met Brit Smith. Some day I would like to meet him and thank him in person for saying yes to me all those years ago and for his generous ongoing support of our community. We are so lucky to have so many incredibly gifted, generous people in our community who devote their time and energy to helping others. Thank you Bhavana Varma and the United Way for being such an inspiration, force for change and voice for those in need in our community. Thank you Sheila and Peter Kingston, Susan Nicholson and Les Herr, and Susan Creasey. And thank you, Brit Smith.